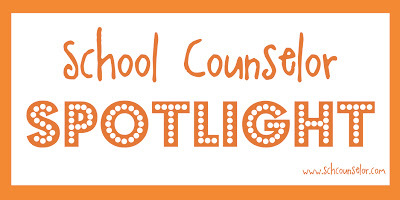 I am excited to announce a new feature on School Counselor Blog - School Counselor Spotlight! 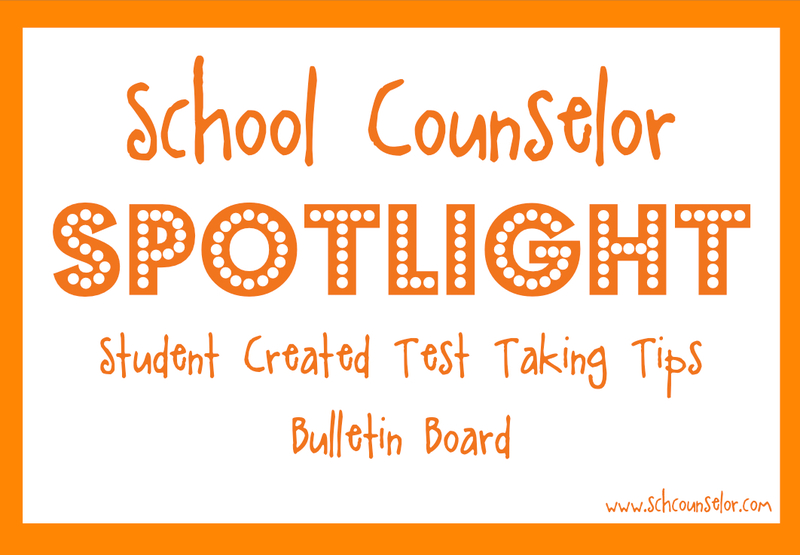 School Counselor Spotlight is a way for you to share your innovative ideas, creative lessons, and quality resources with School Counselor Blog readers! After reading about my To Proficiency and Beyond! Test Taking Tip Bulletin Board, School Counselor Blog reader Kristin shared a test-taking tip bulletin board she created with the help of her students! I have been enjoying your school counselor blog most of the year. It helps to inspire me for activities and bulletin boards. I wanted to let you know that for my test taking bulletin board I actually work with 4th graders and have them brainstorm test taking tips that they would give 3rd graders (who are taking the State Assessments for the first time).. This makes the 4th graders the teachers and the 3rd graders love to see the 4th graders work. After each group of 4th graders has a tip then I take a picture of them acting it out (so if the tip is to eat a good breakfast then they are pretending to eat, if it is get a good night sleep then they are yawning or have eyes closed) then I print the picture out and hang it over the test tip that they have written out and decorated. everyone has fun. Oh, BTW I am a k-6 counselor at an elementary school in Fairbanks, Alaska. Below are pictures of Kristin's student created bulletin board! She had students share the tips and "act out" the tips in the pictures. Here are some close up pictures of the tips that students generated. Tips included eat a good breakfast, arrive at school on time, stay positive, think your question through, get plenty of sleep, Hakuna Matata (no worries), and take your time. I was so excited when Kristin shared her idea with me. 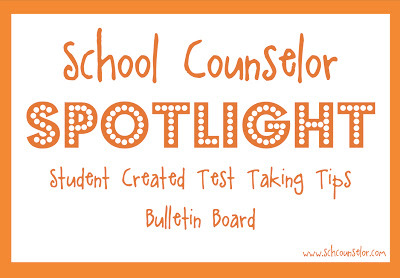 It inspired me to create the School Counselor Spotlight so I can share her idea and other ideas that readers send me with everyone who reads School Counselor Blog! I love that Kristin made a student created bulletin board. She gave students ownership and introduced them to the younger grade as "experts." Students felt great to be "experts" and teach younger students something! Having a visual representation of each tip was a great idea! Having students act out the different tips is also a nice touch! It looks like the students had a lot of fun acting out the various tips! Thank you Kristin for sharing this great idea and being the first School Counselor in the School Counselor Spotlight! 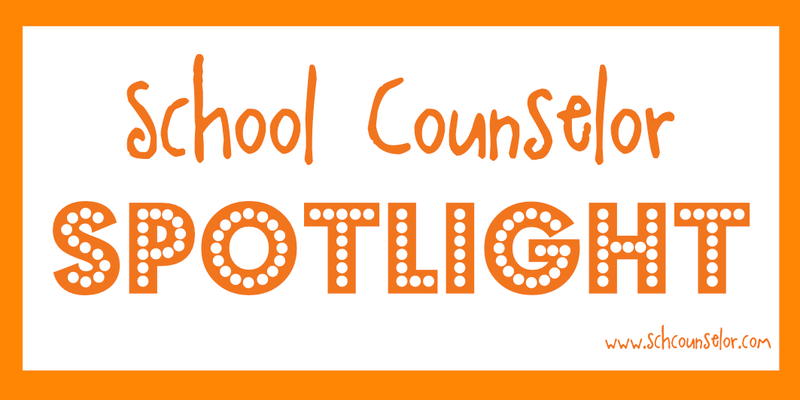 What do you think of this School Counselor Spotlight? Have you ever had students help you create a bulletin board? What test taking tips do you share with students? I love the way you write and share your niche! jaivins academyVery interesting and different! Keep it coming!